In 2016, X-Yachts launched the new pure ‘X’ range which included the X4³ and the X6⁵. In 2018, X-Yachts launched two additional models, the X49 and the X46. This range was exceptionally well re-ceived by both press and clients with approximately 120 yachts sold in the first 2 years, so it seemed the natural choice to design and develop yet another model. The X range incorporates the best elements from both the Xcruising range and the Xperformance range into one beautifully designed performance cruiser capable of delivering Superior Sailing Pleasure. 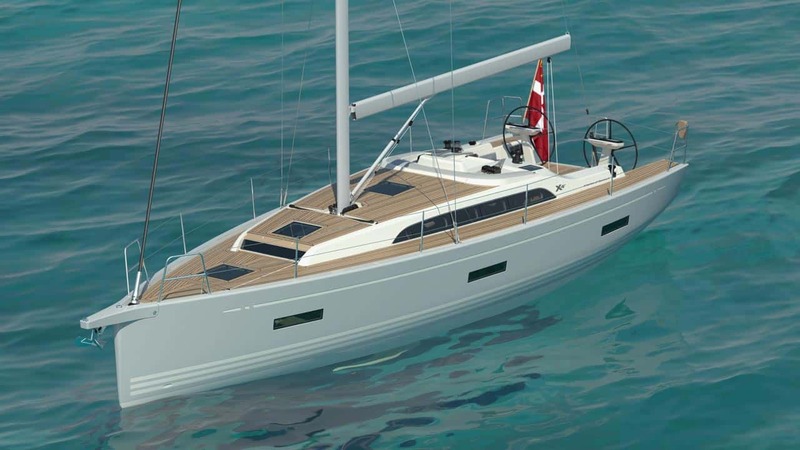 The all new X4⁰ is a forty-foot performance cruising yacht and will thus be the smallest model in the pure X range; blending quality, performance and styling with cruising capability. The X4⁰ contains the DNA of the other models in the Pure X range: a fast and comfortable yacht which is easily managed, a clean and functional deck layout, sleek, elegant lines, and a spacious and modern interior rich with clean lines and luxurious finishes, all contained within a small, affordable package. In the X4⁰ all weight saved is used to increase the yacht’s stability enabling the crew to have a more relaxed time and to feel safer and more comfortable. The X4⁰ will initially be offered in a 2-cabin layout, but from 2020 they will add a 3-cabin layout to the model configurations. The X4⁰ is currently under full development and is expected to launch early Summer 2019 for sea trials and testing.